Farmers are chopping silage at the normal time on the calendar and commenting on the very green corn in the fields. Silage corn was planted late this spring and that delays corn development. The summer was cooler and cloudier than normal, which also delays corn development. Finally, there is a lot of biomass in the corn this year, so drydown may take a little longer. Corn chopping may need to be delayed several weeks this season to get corn to the proper moisture. As producers gear up for wheat planting, calibration of the seeder is extremely important. Below are two tables to use as quick references in the calibration process. Most producers are using drills with 7.5-inch row spacing. The first table calculates how much seed to collect in 50 linear feet from one row of the drill. Target populations of 30 and 35 seeds per square foot are used for the calculations. The needed seed weights are listed as ounces (oz.) and as grams. As I travel around the countryside, I see plenty of emerging corn in fields that will likely be planted in wheat. This “Green Bridge” could lead to problems with certain insects important to wheat Production. The insect pests we need to consider have not changed from previous years, but their relative importance may have changed from last year. Fall armyworm (FAW), Hessian Fly (HF), cereal aphid complex (CAC), and wheat curl mite (WCM) are annual threats. In most years, only the CAC is of major concern. 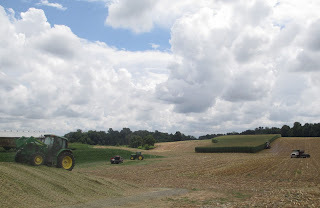 In 2012 the FAW was a considerable problem in west Kentucky, not only in wheat,but also in many forage grasses. even though N deficiency is evident.